Remodeling a kitchen is an exciting project, especially for those of us who have an immense love of cooking and gathering at the kitchen table. Even if you aren’t the family chef, you have to admit that as Americans, we spend an awful lot of time in the kitchen, even watching other family members do the cooking. 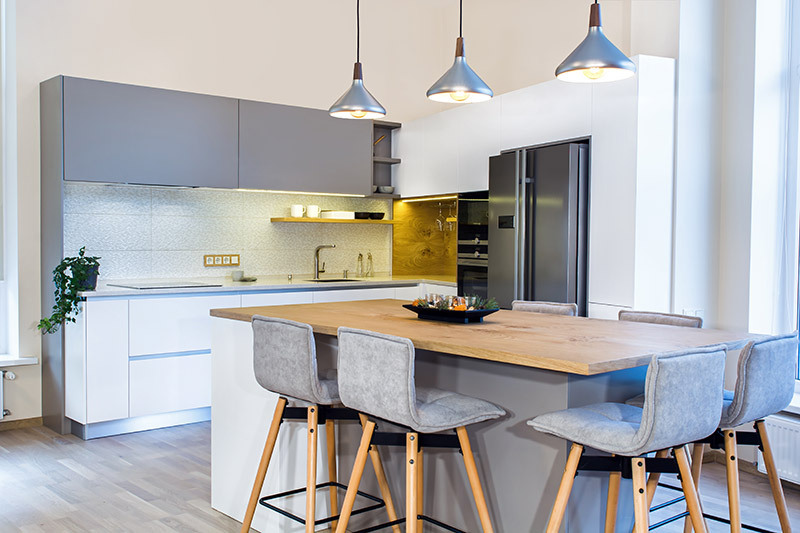 Homeowners who are new to a complete kitchen remodel may overlook certain aspects that can be added or changed, so here we have compiled a list of amazing ideas that can transform any kitchen. The countertop is one of the first things to be remodeled when kitchens are concerned, and yours should be no exception. A countertop is not only for meal preparation but is also an immense contributor to the kitchen’s look and style. The color, material, and texture of the countertop set the tone for the rest of the kitchen, and a new countertop should be selected with care. When selecting a new countertop, consider its look, but more importantly, look for a material that will offer you both longevity and durability. After all, you are hoping that a new countertop solution that will last you a lifetime. You might believe your current decades-old sink is “good enough” because it does the job it is designed to do, but think again. It is the small working parts of a kitchen that tremendously contribute to the overall style, atmosphere, and feel that make it welcoming and modern. An old kitchen sink has no place in a new kitchen in which you have worked hard in updating. A new sink doesn’t have to be flashy, but by replacing your old sink, you will tell in a heartbeat that newer models are sleeker, more modern, and more streamlined. Aside from sheer looks, a kitchen sink is one of the most functional parts of a kitchen, and with a complete remodel, the sink in which any cook spends most of his or her time should be updated. Kitchen islands are not only a unique addition to any thorough kitchen remodel but are also incredibly useful. An island can break up the kitchen, offering guests a casual place to be seated on barstools so the at-home chef can entertain while cooking. An island offers this ability to entertain and make the kitchen more inclusively while also providing an extra area for storage for those bulky pots and pans, cookbooks, baking sheets, and everything else that never seems to fit in ordinary cabinets. Islands can be purchased in hundreds of styles, shapes, amenities, and colors. Their dual purpose of extra storage and extra seating has made this remodeling choice extremely popular and trendy. Homeowners don’t consider that replacing the knobs and drawer pulls in their kitchen is not exactly apart of a remodel, but they would be wrong! 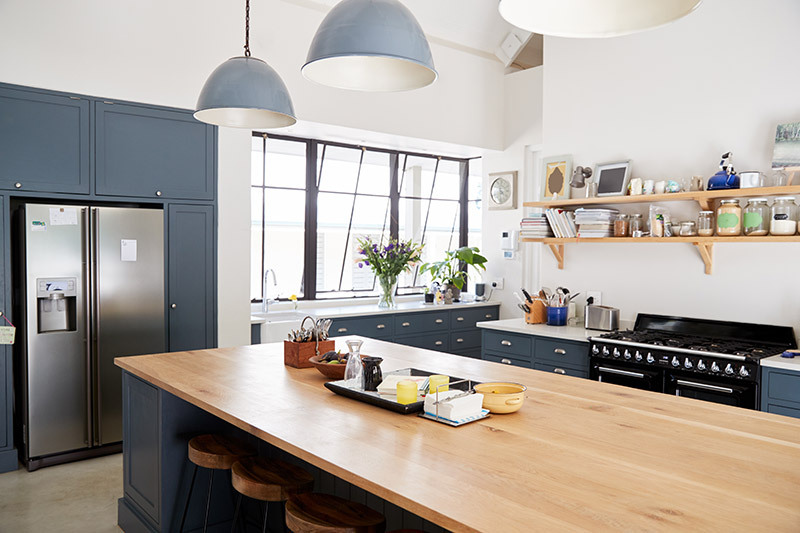 A fresh coat of paint on your kitchen cabinets and shiny new knobs can transform any kitchen from old to refreshingly new and sleek. Little aspects of a kitchen can add up to its overall look, and knobs are certainly a piece of the big picture puzzle. Knobs are available in numerous styles and colors, from simple silver to dark brass with a bit of stylish flourish. A full kitchen remodel can include investing in new appliances along with upgrading countertops, cabinets, and even floors. New appliances not only look better, but will obviously offer a better performance in contrast to your old stove, microwave, and oven. Fridges and stoves take up a lot of space in the kitchen, so it is important for a kitchen remodel to have these appliances look uniform with the rest of the kitchen’s style. The best part about investing in newer appliances is that it can be done at any time and most stores even offer free delivery. In many remodels, open shelving is an aspect that may not even be considered, but the tides of current trends have begun to favor this clean, organized design. Open shelving breaks up the monotony of enclosed kitchen cabinets and presents glassware, unique bowls, patterned plates, and treasured china in a way that is fashionable and aesthetically pleasing. The greatest quality open shelving has to offer is that it is interchangeable, meaning you can switch out the display whenever you want. This can give your kitchen a new style and theme at you choosing. Depending on how much space you have to play within your kitchen remodel, don’t discount the traditional breakfast nook. A breakfast nook doesn’t have to take up space, either. You can include bench seats with storage and even implement a built-in bookshelf on the seating’s side. By placing shelving above the tablespace, you can utilize vertical storage. Dining rooms have gone by the wayside in today’s culture, and a breakfast nook is a good compromise for traditional gathering while still remaining casual. You may find yourself immersed in the countertops, cabinets, and new appliances while remodeling your kitchen, but be sure you do not overlook investing in new windows. Kitchen windows can get left behind in terms of a remodel, and this can mean missing out on a way to upgrade your home while seeing an excellent return of your investment. Energy efficiency is crucial in relation to reselling a home, saving on monthly energy bills, and energy efficient replacement windows will greatly contribute to your home’s curb appeal. You would be surprised what Energy Star Certified replacement windows will do for your kitchen, an area of the home prone to excess heat and ventilation, and should be considered for every kitchen remodel. The backsplash in a kitchen is often overlooked, but it doesn’t have to be. Depending on what countertops you have or are planning on purchasing, you can make your backsplash stand out. This backsplash can give dimension to your kitchen space, making your cabinets and countertops stand out. You can design your own pattern to achieve a customized style to compliment the rest of your kitchen. Backsplash patterns can achieve any look, from modern to traditional, to granite or even polished glass—the possibilities of a unique backsplash are endless. These are only a few ideas for a kitchen remodel, there are numerous other aspects of a kitchen that you can consider including when planning your project. Before you begin the purchasing and building process, be sure to consider the whole spectrum of your options first, that way you won’t regret not including something after it is all said and done. Keep in mind that there are aspects in a kitchen remodel that are worth the investment while others you can skimp on, like maybe choosing to apply a fresh coat of paint over completely reconstructing new cabinets just yet. You can wait on getting a new fridge or stove, as they are appliances available year-round with more attractive pricing during sales, but consider replacing windows and countertops with high-quality materials. The planning process for a kitchen remodel borderlines tedious and exciting, but the end results will have you glad you thoroughly went through each viable option for your dream kitchen. Kitchen remodeling is an exciting project and hopefully this article gave your insightful information to guide you on your remodeling project. With Feldco, you can easily find a quality window style that you’ll like. Over 350,000 homeowners trusted us with quality product and installation. Get a free quote and speak to a product specialist today!